The last of our 3-day visit to Minamisanriku and the surrounding areas, we were able to visit several evacuation sites, and sang songs at 3 of them. First, we went back to Shizukawa High School on the top of the hill to give them a bunch of CDs that we burned in the car, which is where this picture was taken. I don't have a picture of it, but we went back to Natari to sing for the people evacuating in the Natari Hoikuen. 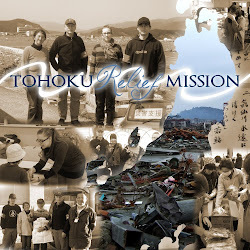 This is us with the evacuees who were staying at the Tsunomiyasou Minshuku. Most of the young people were out working. The last stop of our day was the Kaiyou Shounen no Ie. They had no power (like most sites in Minamisanriku) and so all of the photos were dim and fuzzy, as it was getting later in the afternoon. There were a few kids, playing with some volunteers, and we were able to sing for everyone in the main lobby. This is a photo of the back of our car at the end of the day. What a whole lot of dusty car-rides through rubble will do.